All of Apple's AppleCare+ plans for Macs, iPads, and iPhones, must be bought alongside a new device or within 60 days of purchase, according to AppleCare+ support staff that MacRumors spoke to this morning. 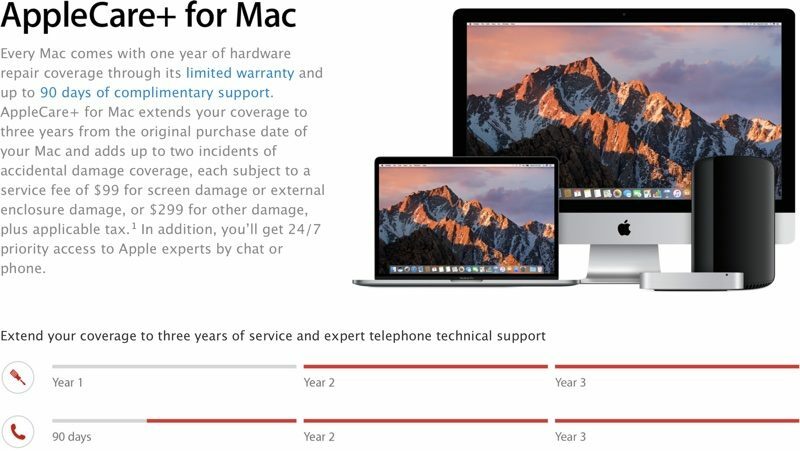 Following its Worldwide Developers Conference in June that saw the debut of new iMacs, MacBooks, and MacBook Pro models, Apple introduced an updated AppleCare+ for Mac warranty plan that provides standard AppleCare coverage along with accidental damage coverage. The original AppleCare plans for the Mac could be purchased while the Mac was still under its standard warranty, so customers had a year to buy it, but with the new AppleCare+ plan for Mac, a purchase must be made within 60 days. Apple in March changed its AppleCare+ policy for the iPhone and iPad and temporarily allowed customers to purchase the plan for up to one year after the device's purchase, while it too was still under standard warranty, but that policy appears to have been reverted back to 60 days. 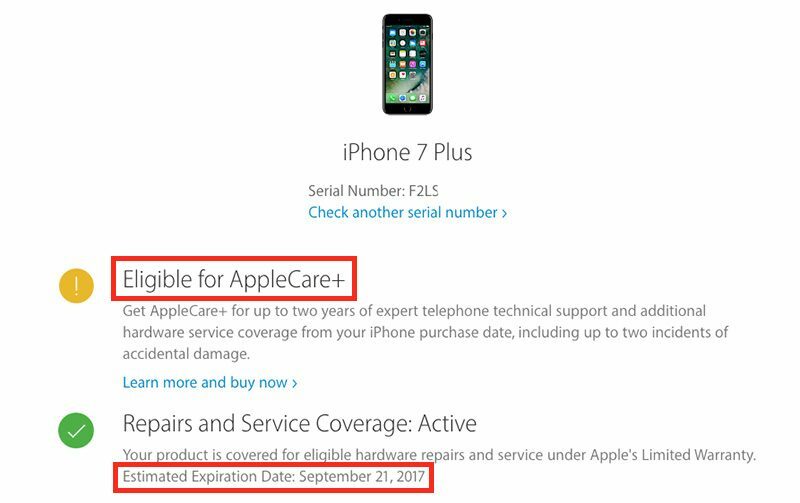 AppleCare+ plans for the iPhone and the iPad must once again be purchased within 60 days of a device purchase. Attempting to make an AppleCare+ purchase on an iOS device purchased more than 60 days ago now brings up no AppleCare+ purchase options when logging into the AppleCare+ website. As for the Mac, customers who have had their Macs for longer than 60 days but less than a year are not eligible for AppleCare+ but are still able to purchase a standard AppleCare Protection Plan, MacRumors has learned. 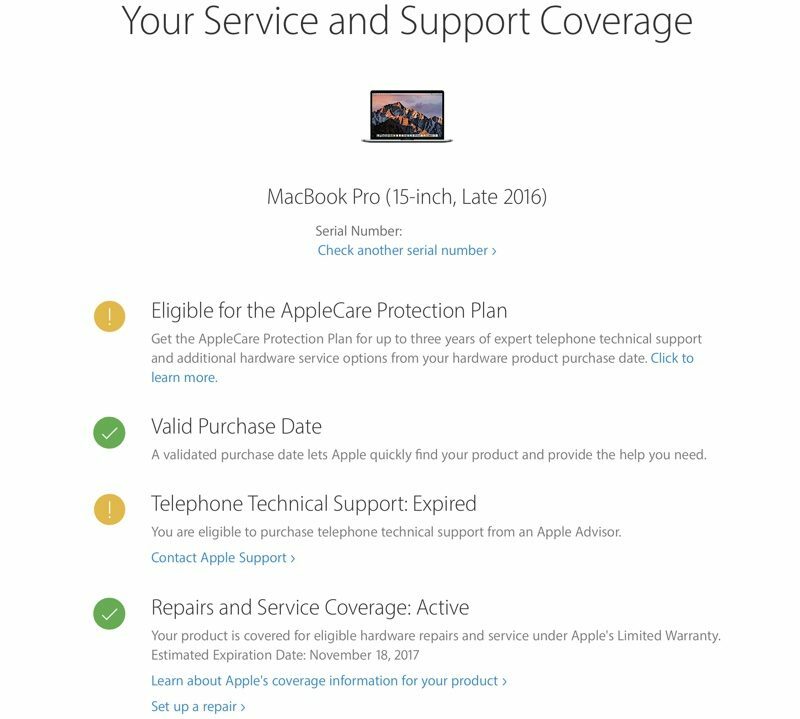 Apple is only offering AppleCare+ for Mac on its website, so customers will need to call in to Apple Support to make the standard AppleCare purchase. Standard Mac AppleCare is priced at $149 to $349, depending on the machine. AppleCare+ for Mac is available for the MacBook, 13-inch MacBook Pro, 15-inch MacBook Pro, MacBook Air, iMac, Mac Pro, and Mac mini, with prices ranging from $99 to $379. The plan extends the warranty of the Mac to three years and includes coverage for two incidents of accidental damage, but a service fee of $99 will be charged for screen damage or external damage while a service fee of $299 will be charged for any other damage. AppleCare+ for iPhone is available for $129 for the iPhone 6s and later, $99 for the iPhone SE, and $99 for iPad models. It extends warranty coverage to two years and covers two incidents of accidental damage, with a service fee of $29 required for screen repairs or $99 for other damage. Purchasing AppleCare+ for Mac, iPhone, or iPad after the device has already been purchased requires customers to run a remote diagnostic to ensure the device is working properly or have it inspected at an Apple retail location. I wish Apple would just ditch the one year warranty and cover everything for three years out of the box. I doubt the profit hit will be that big, and it would show so much goodwill towards customers. I've seen VERY few Apple devices fail by themselves in the past few years, especially since Macs have moved to using mainly solid state disks. They can continue selling AppleCare, just have it be accidental damage protection. 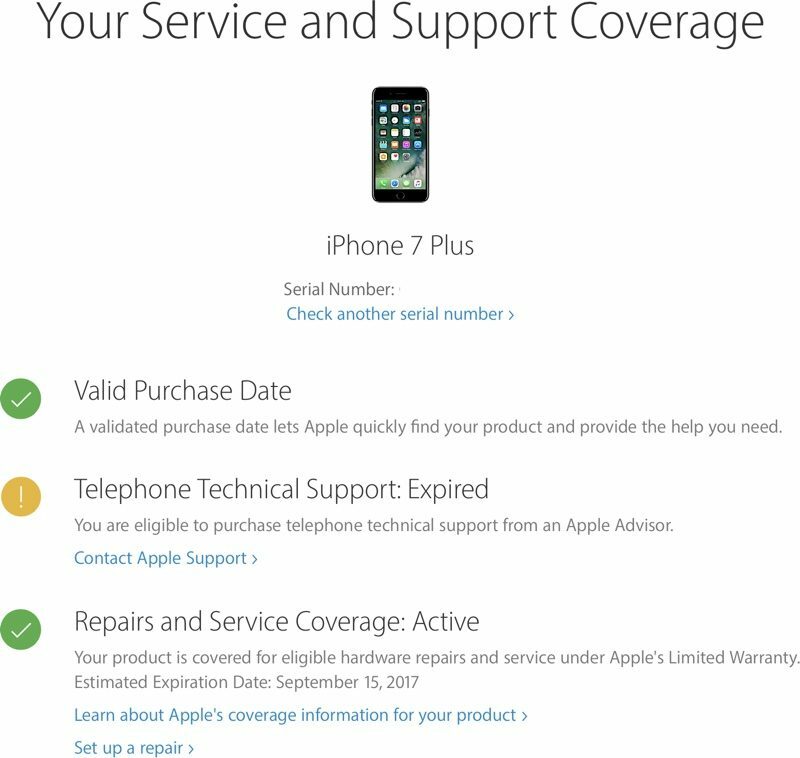 Apple Care+ is nice if you need the accidental damage warranty. However, the base Apple Care is a waste of money. I buy all of my goods with either my CITI Bank or Discover card. Both of which extend the manufacturer's warranty by an additional 1 and 2 years respectively. And you only need to purchase a portion of the good on the preferred card. I think my AMEX does the same but I haven't used it for that purposes. Point being, use the free service with your credit card while saving money with piece of mind. Don't they make you jump through hoops when you try to use their warranty services? With Apple, you just take it into the store for repairs/replacements. Accidental coverage is a huge plus, especially given that the cost has not changed at all. This is good. Big FU to the buyers of their 2016 models that also bought AppleCare. Why do people take this sort of thing personally? Companies don't change prices or features out of spite, they do it to entice new buyers. If the price and features met your needs at the time you made your purchase... that was your decision. If you delayed your purchase in hopes that something better comes along... also your decision. while a service fee of $299 will be charged for any other damage. 678 for a worst case scenario? Worthless in Europe, except for the accidental damage, but you can buy insurance here for a LOT less. Also, I think for a brand like Apple they should provide minimum 2 years and preferably 3 years on their expensive electronics. As of now Apple just makes heaps of money on this "scheme". Of course it's only when I purchase Apple Care+ that I never end up needing it. It's when I missed the window of opportunity that my iPhone fell into the pool or when my kids knocked the iMac off the table breaking the screen. Murphy's Law prevailed. This is true. When you try to use the warranty from the credit card, you're working with a third party insurance company. You can get it done, but it's not painless. I have a similar protection deal that comes with my VISA card, and the way the contract reads is I just pay for the repair myself through Apple or whatever, then I send VISA the receipt and they reimburse me. There is nothing in the wording that I have seen about dealing with any third party at all.